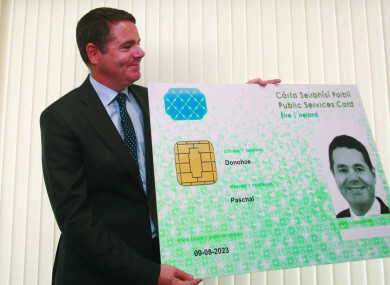 Paschal Donohoe at the Public Services Card Centre in D'Olier House in Dublin in 2016. A WOMAN WHO stole nearly €140,000 in fraudulent social welfare payments was caught after suspicious officials arranged for her to have her Public Services Card photograph taken. Maria Redmond (60) claimed an invalidity pension for 13 years while she was working as a cleaner in Our Lady’s Hospital for Sick Children, Dublin Circuit Criminal Court heard today. Redmond, with an address in Comeragh Road, Drimnagh, Dublin, pleaded guilty to 14 counts of stealing property from the Department of Social Protection between November 2002 and September 2015. Garda Ian Abbey told Diarmuid Collins BL, prosecuting, that Redmond had two PPS numbers in two different names, including her maiden name, Delaney. She had her second PPS number registered at her sister’s address. The court heard Redmond, a mother-of-four, was eligible for an invalidity pension when she first claimed it in 1995. However, when she started working in 2002, she failed to inform the department of her change in circumstances. The court heard that officials in the department became suspicious that Redmond and Delaney were the same person and an investigation began. They spoke to her employers and obtained a copy of her passport photograph before arranging for Redmond to come in to get her Public Services Card. Once Redmond’s photo was taken for the card, officials were able to determine she was the same person. When arrested, Redmond told gardaí that because she was only working for three hours a day, she did not think she was doing anything wrong. She said she knew it was wrong to apply for a second PPS number, but said a lot of people she knew were working and collecting social welfare. She told gardaí she was “sorry, ashamed and embarrassed”. Defence barrister, Emmet Nolan BL, said his client, a separated woman with no previous convictions, was extremely remorseful for her actions. He said she used the money to “pay her mortgage, keep a roof over her head and look after her children”. Redmond is no longer working and receives €191 a week in social payments. She is repaying the money she stole from the department at a rate of €25 a week. The court heard Redmond earned €160 a week as a part-time cleaner at the time of the offending, prompting Judge Martin Nolan to query whether Redmond would have been eligible for a social welfare payment, “had she declared herself honestly”. The judge adjourned the matter to this Thursday to see if this might be the case and to readjust the monetary loss to the Department of Social Protection if necessary. Comments are closed as legal proceedings have yet to conclude. Email “Woman who stole €140k worth of fraudulent benefits caught after picture taken for Public Services Card”. Feedback on “Woman who stole €140k worth of fraudulent benefits caught after picture taken for Public Services Card”.